We’re starting work on the Android version of Speech Timer. Aireen will be doing much of the development work as she spearheads our venture into the platform. Speech Timer will be our first application Android, since we had to prematurely kill Fund Watch because iFast Financials sound like they hate it. This will be a 100% re-write from the ground-up specially for Android. One reason is that Speech Timer was originally written as a native iPhone application using Objective-C. The other reason so that we can also provide the best user experience and battery life possible on Android. 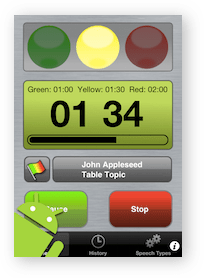 Since this is a re-write, here is your chance to say what you want in the Android version of Speech Timer. You can use our contact form, e-mail us, write a comment in this post, or even contact any of us directly. Also I’ve just launched a website especially just for Speech Timer. The site will be more focused towards Toastmasters, speech clubs, and public speaking in general. If you want to be the first to know when Speech Timer is launched or become a beta tester for Speech Timer, please tell us by entering your e-mail in the form below. Don’t worry, we won’t spam you nor give out your address to others and you can unsubscribe anytime. PS: We are still not affiliated with Toastmasters International.